The Governor of Ekiti State who has volunteered to help Buhari run the country has abandoned his official duty and has updated Nigerians on the health status of Mr President. 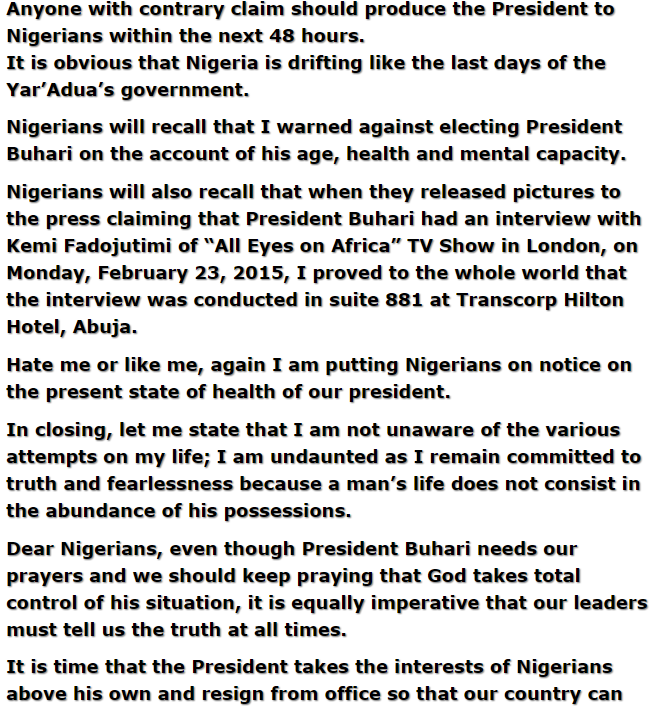 The “Gboromideleru” governor today released an official press statement to vindicate his pre-election attacks on Buhari. 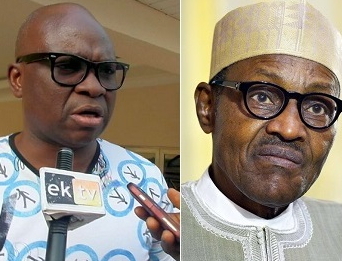 Fayose who is eyeing the seat of the President in 2019 said Buhari is currently in coma and has been on life support since June 6, 2017. Fayose seems more excited that Buhari is incapacitated. Though everybody prays that the president should get well and return home but truth is always bitter. The audio message released this past weekend is fake. Nigerians like to vilify somebody when he/she says the truth, Fayose is a fearless politician. Though I do not like Buhari’s policy, I do not wish him death. I pray he gets well. The only thing he is doing that I like is the fight against corruption. Silence is the best answer for a fool. Nobody has power over death at the appointed time. I wish our President a quick recovery. when will stop pretending and fighting against truth. 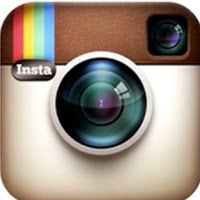 Sometimes i wonder your personal makeup. Who is wishing death here? [lease be truthful to yourself. He is SICK and that’s it. Even if he recovers, does his health not worth protecting? His health does not need stress let alone stress of overseeing a country like Nigeria. Except you dont wish him well. who is deceiving who here. Please stop pretending. By the way who is wishing him death here except those of you who refused to see the truth about his health because of selfishness. Can you compare his health with the load he is carrying as a leader? The leadership of this country does not worth sacrificing your life. Come to terms with this, is people like you that wish him death, since you refused to see the truth that he does not need stress let alone carrying the stress of a country as big as our country. Please grow up dear. Buhari is finished,Nigeria is ran by the cabals they’re the ones in charge of the country not osibanjo and they’re holding on for as long as possible,APC has failed us,thank you fayose for exposing their secrets. 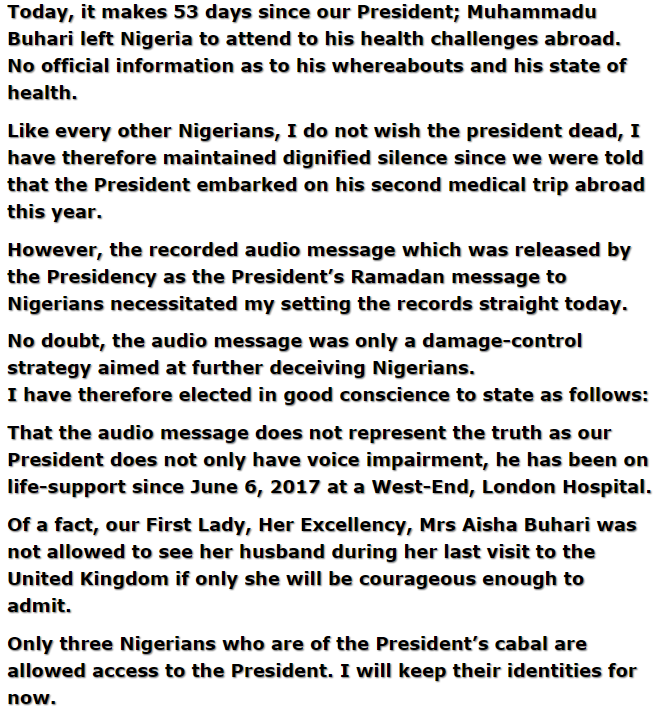 In as much as we are praying for president Mohammed Buhari to recover soon from his sickness, it is highly undemocratic and unreasonable to continue to keep Nigerians in darkness and lying to us about PMB HEALTH condition in London. Our democracy should never be built on a single man, family, cabal or tribe. In a true democracy, Nigerian people should have been addressed by Vice president Osinbajo, and the Senate on the progress and conditions of President Mohammed Buhari and when he is due to resume work as president. We deserve to know his where about, his present health state, and when the president is due to be back to continue to govern as elected. That fake audio message doesn’t speak well of this administration. Why are they lying to Nigerian people, the senate, and even the vice president as if PMB is the president of Kastina state or Northern region. And for those of you wishing the president death, shame on you for your hatred and wickedness. I urge the national assembly to inquire about the true health condition of a president who was elected to serve Nigerian interests by overwelming support and votes from very geopolitical region of Nigeria. I don’t respect and will never listen to lies and fabrication without evidence from a criminal governor Fayose. VP Osinbajo should tell us what he knows about PMB health conditions while we continue to wish President Mohammed Buhari a soonest recovery. Yar’dua part 2, grab your copy nowwwwww. Hausa fulanis are most unfit to govern nigeria. Fayose, the so called mouth piece of Nigerians, Agbororo. Ekiti state civil servants are still waiting for their unpaid salaries. You are the only one that sees what others cannot see Abi? Well done! Death is inevitable for all of us one day, whether we like it or not. Let us continue to pray for Nigeria. President Mohammed Buhari we wish you speedy recovery. Let’s appreciate the truth when we hear ONE. WHEN YOU MADE yourself a pharoah, the karmer that caught up with him will catch up with you. No mortal or imortal entity can stand the God of the Christians. Let pmb come and islamize Nigeria Let‘s see him do it. Nonesense. Let him come and continue paying a dept as they (muslims) called it, to OIC on behalf of Nigeria. Let him come and remove CRK subject from all secondary schools in Nigeria while retaining IRK subject. Let him come and be playing mute to his fulani herdsmen brothers attacks on innocent unsuspecting villagers and pesant farmers. His boko harams brothers has taken more souls than the second world war had taken yet some people are wishing him a comeback to continue the good work he has started. Which good work if I may ask? You mean the inflation or devaluation, or the starvation and corruption?